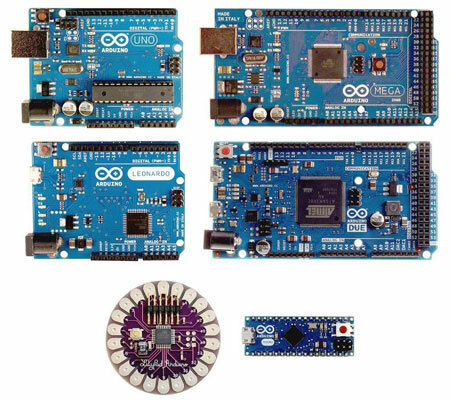 Which Arduino Do You Need for Your Project? The Arduino project has come a long way in only a few years. It started out with just a single simple board that offered basic features and did not have a USB connector. You can now find over a dozen Arduino boards, each with its own unique characteristics and features. The current full listing of Arduino products is on the Arduino website. Select the Arduino that best matches your needs. Arduino Uno: This is the main workhorse in the Arduino family. The Uno is based on the ATMega328 microcontroller, and operates at 16MHz. It has 14 digital input/output (I/O) pins and 6 analog input pins. Power can be provided over the USB connection or DC Barrel connector, or by using power input header pins. The onboard power regulator is smart enough to know which one is being used. It has a handy onboard “utility” LED connected to digital Pin 13, and a reset button for when things get weird. A key difference of the Uno from all previous boards is that it has a USB controller chip integrated onboard. This feature makes it much easier to hit the ground running because you simply plug it into your computer and the device will be recognized. Previous versions required you to install software drivers for a USB interface provided by FTDI. Arduino Mega: The Mega 2560 is the Uno’s big brother. It has all of the basic functionality and is fully compatible, but benefits from a ton of extra connections — 54 digital IO pins and 16 analog input pins! It also has more pins that offer pulse-width modulation (PWM), which is useful for dimming LEDs and controlling motors. It costs a little more, but if you want to control an army of devices or read in a fistful of sensors, this Mega is the way to go. Arduino Leonardo: The Leonardo is similar to the Uno, but has a more digital I/Os (20) and analog (12) inputs. Where it really stands apart, is that it has a second serial port. It can also do some nifty tricks like emulating a keyboard and a mouse. It can be programmed to control these input devices so your computer will act as if it’s receiving keyboard and mouse input. Lilypad Arduino: The Lilypad is an Arduino with personality! It’s a favorite of people who want a little style and designed for sewing into wearables and textiles and clothing. It has almost the same number of digital input/output pins as a regular Arduino, but they are arranged in a circle and the connections can be sewn into clothing with conductive thread. Running at 8MHz, it’s “fast fashion”! Arduino Micro: The Micro is super cute and perfect for tight spaces. It has only the essential requirements — a built-in micro USB connector and 20 digital input/output pins. It has no pin headers, so you solder connections directly onto the board itself. You can also solder on headers so that it can be inserted into a breadboard. Arduino Due: The Arduino Due boasts a much beefier processor and is really a full-fledged computer on a board, similar to a Raspberry Pi or a BeagleBoard. It has an Atmel SAM3X8E ARM Cortex-M3 CPU that runs at the brisk pace of 84MHz, and 54 digital ports. It’s more robust and uses 3.3V DC onboard rather than 5V DC, so you should avoid it for the projects here. You may also come across older boards and want to use them for your project. Older Arduinos you may encounter are Diecimila, Duemilanove, NG, and Bluetooth. Be aware that the Arduino IDE has changed a bit as the hardware has evolved and not all the older boards will work with the most current IDE. Also, some software libraries that offer extended features are not compatible with some of the older boards. If you have trouble with a project using one of the older boards, you may want to try it out with an Arduino Uno instead.